Although the nectarivorous Trochilidae are today among the most characteristic birds of the New World avifauna, Paleogene stem group representatives of this taxon were only found in fossil sites in Europe. Wing remains of a small hummingbird-like apodiform bird were first reported by Karhu (1988) from the early Oligocene of the Caucasus, who assigned these bones to the species Jungornis tesselatus within the new taxon Jungornithidae. Subsequently, Karhu (1999) also classified a second, slightly older and less derived species from late Eocene deposits of the Caucasus into the Jungornithidae. This bird was described as Argornis caucasicus and is likewise only known from wing and pectoral girdle elements. Karhu (1988, 1992, 1999) noted that Jungornis and Argornis share characteristic features with modern hummingbirds, including a derived morphology of the proximal ulna, and, in Jungornis, a protrusion on the humeral head, which is only found in hummingbirds and allows rotation of the humerus during hovering flight. He attributed these similarities to convergence, and considered Argornis and Jungornis to be aberrant swifts with hummingbird-like specializations. However, there are no derived morphological traits that are exclusively shared by Argornis, Jungornis, and swifts, and not also found in hummingbirds. Accordingly, analysis of the phy-logenetic relationships between modern and fossil apodiform birds showed the "Jungornithidae" sensu Karhu (1999) to be paraphyletic, with Argornis being the sister taxon of a clade including Jungornis and crown group Trochilidae (Mayr 2003c). Another species of Jungornis, J. geraldmayri, was reported by Mourer-Chauvire and Sige (2006) from the late Eocene (MP 17) of the Quercy fissure fillings, and is based on an almost complete humerus. 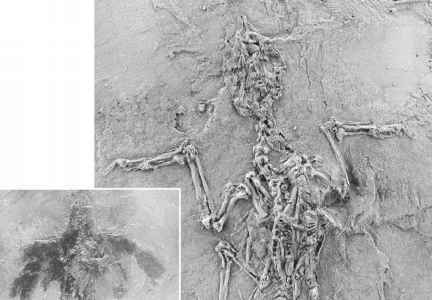 Argornis and Jungornis are only known from wing elements, but an Argornis-like bird, Parargornis messelensis Mayr, 2003, was described from Messel, and is represented by a complete skeleton with well-preserved feather remains (Fig. 12.11; Mayr 2003d). The beak of P. messelensis is short and swift-like, and as in all apodiform birds the humerus is strongly abbreviated. Most notably, however, the feathering of this species resembles that of owlet-nightjars and is very unlike the feathering of swifts and hummingbirds in that the wings are short and broad, and the tail is long. The peculiar wing morphology of Parargornis, i.e., the combination of a greatly abbreviated humerus with a short and broad wing, has no counterpart among extant birds and may represent an early stage in the evolution of hovering flight. Parargornis, Argornis, and Cypselavus into the new taxon Cypselavidae, but there remains a possibility that the similarities between these birds are plesiomorphic. Essentially modern-type stem group hummingbirds, which appear to have been nectarivorous and capable of sustained hovering flight, occur in the early Oligocene of Europe. The first described species is Eurotrochilus inexpectatus Mayr, 2004 from Wiesloch-Frauenweiler in Germany, which is known from partial skeletons of three individuals (Fig. 12.12; Mayr 2004e, 2007d). 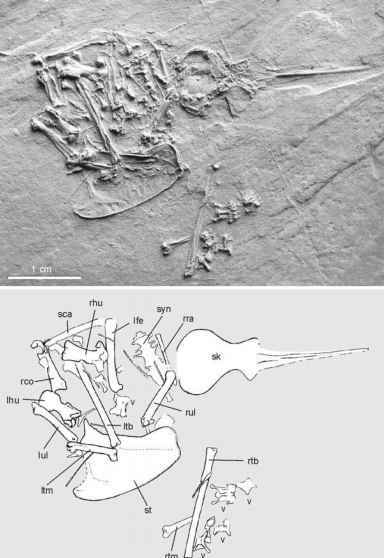 A second species of Eurotrochilus, E. noniewiczi Bochenski and Bochenski, 2008, was reported from the Flysh (about 31 Ma) of Poland (Bochenski and Bochenski 2008), and is also based on a partial skeleton. A complete skeleton of Eurotrochilus sp. was further discovered in the early Oligocene of the Luberon in France (Louchart et al. 2008). Apart from a similar morphology of the bones, E. inexpectatus shares with extant Trochilidae a tiny size and greatly elongated beak, as well as a marked depression on the caudal surface of the proximal end of the ulna, and the presence of a distal protrusion of the humerus head (Mayr 2007d). The latter feature is more marked than in Jungornis and approaches the condition found in extant hummingbirds. As in crown group Trochilidae but in contrast to that of other apodiform birds, the ulna is further only slightly longer than the humerus. The feathering of Eurotrochilus was similar to that of some extant hummingbirds (Louchart et al. 2008). 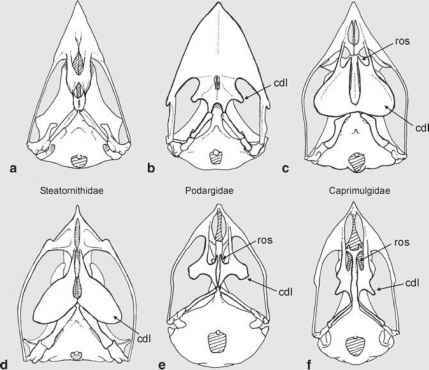 These fossil hummingbirds nevertheless differ in a number of plesiomorphic features from their living relatives. They are thus outside crown group Trochilidae and do not have a bearing on the area of origin of the crown group, whose stem species unquestionably lived in South America or Central America. Whether Paleogene stem group Trochilidae also occurred in the New World is unknown but likely, given the great similarities in the early Oligocene avifaunas of North America and Europe (Chap. 17.1.1). The long beak of E. inexpectatus indicates that the species was nectarivorous. The swift-like bill of Parargornis, by contrast, suggests that the stem species of Pan-Trochilidae was insectivorous. If interpretation of the wing morphology of Parargornis is correct (see above), capability for hovering flight evolved in the stem lineage of the Trochilidae before a nectarivorous feeding behavior, and may have enabled Parargornis to glean insects from the underside of leaves or around flowers (Mayr 2005g; Mayr and Manegold 2002). The Eurotrochilus fossils are also of interest concerning the evolution of orni-thophilous flowers in the Old World. Because hummingbirds are capable of sustained hovering flight, many extant hummingbird-pollinated plants differ from Old World ornithophilous plants in that they do not provide perches near the flower. Surprisingly, however, some Old World plants, which occur in areas without hovering avian pollinators, exhibit a flower morphology similar to that of those pollinated by hummingbirds in the New World. Examples therefore are the Himalayan Agapetes spp. (Ericaceae), the East African Canarina eminii (Campanulaceae), the South African Tecomaria capensis (Bignoniaceae), as well as the West African Impatiens sakeriana (Balsaminaceae), and Sabicea speiosa (Rubiaceae) (Mayr 2005g). It now seems possible that the flower traits of these plants may indeed primarily constitute an adaptation to pollination by hummingbirds, which after the disappearance of hummingbirds from the Old World may have been taken over by long-tongued bees and other insects (Mayr 2004e, 2005g).